It seems ol Vlad The Propeller Putin is p-o’d at US over a planned missile defense system in Europe. Since when do we have a working missile defense system? Last time I checked, that stuff doesn’t work yet. Talk about a tempest in a teapot. Putin’s threatening to vaporize millions of innocent people because he’s afraid of boogie man that doesn’t exist. He’s as crazy as the Shrub. 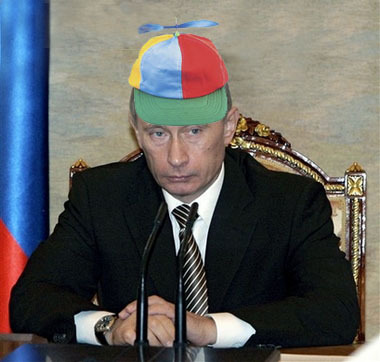 Why, you ask, do they call him Vlad the Propeller? Good question. I don’t know, but Shrub reportedly just calls him Beanie.